Description: Alex and Conner Bailey's world is about to change, in this fast-paced adventure that uniquely combines our modern day world with the enchanting realm of classic fairytales. "I've never met a person I didn't learn something from!" Grandma said. "Even the most monotonous people will surprise you. Remember that." "What was I supposed to tell Mom when she got home? Hi Mom, hope you had a good day at work. Alex fell through a book. By the way, what's for diner? Give me a break!" "It's Rapunzel's tower!" Alex said., and her eyes became a little misty at the sight of it. "Are you seriously crying?" said Conner, who was still on the ground. Very cool that you have a signed copy! This one sounds like a lovely read ... too bad that it's a little predictable for older readers, but it's nice to hear that the writing is good. I received this one by accident from Hachette and am really looking forward to reading it! 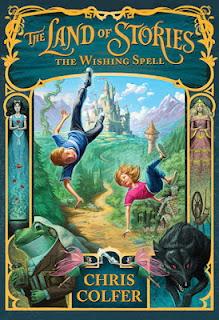 I'm a fan of Chris Colfer so I can't wait to read this one!! I'm so jealous that you got a signed copy!! Also, I love the way you rate books by Dewey's, very cool. If you got two arcs, would you be willing to give one away?